Halloween! What a marvelous, playful time of year where everyone can try on their favorite phantasmic character for an eve … or a weekend. (Any ideas for a pregnant-bellied mamma?!) It’s also fabulously timed with our bodies’ shift from light, raw summer foods to heartier fall foods like pumpkins, root vegetables and orchard fruit. Jack-o-lanterns abound and children (and grownups) go bobbing for apples. And of course, there’s candy in everlasting quantities. So, when I heard that Nuts.com was looking for recipes to celebrate with healthy treats that won’t frighten the waistline, I got inspired. Granted, my pregnant waistline isn’t exactly trim right now, but I’m especially conscious of keeping my sugar consumption low. 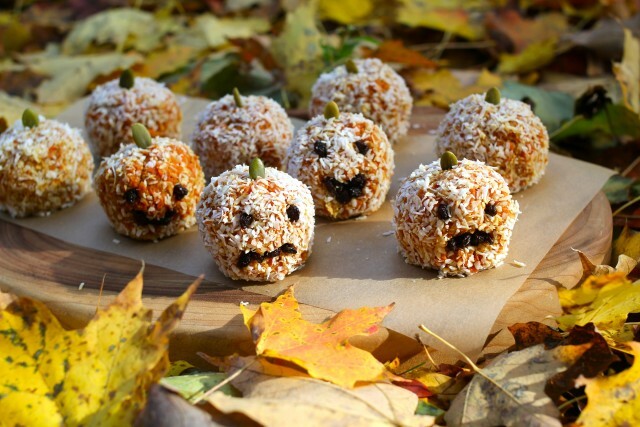 So I set to work creating a hair-raisingly healthy, spooktacular treat that says “hocus pocus” to traditional candy. I had just picked up my CSA share, and had a drawer full of carrots in the refrigerator. Carrots are one of those magical vegetables that are both sweet and nutritious. In fact, my sister-in-law boils carrots into quinoa porridge for her two-year old daughter, making a more palatable and healthy breakfast. Some quick research on carrot desserts led me to the Indian specialty, Gajar Halwa, a shredded carrot dish simmered in milk, sugar and spices. (Readers, please correct me if the dish name is wrong – there were so many variations out there). I’ve most often had it served in a bowl, but Chef De Home had the sweetest truffle-shaped Gajar Halwa that instantly conjured jack-o-lanterns. 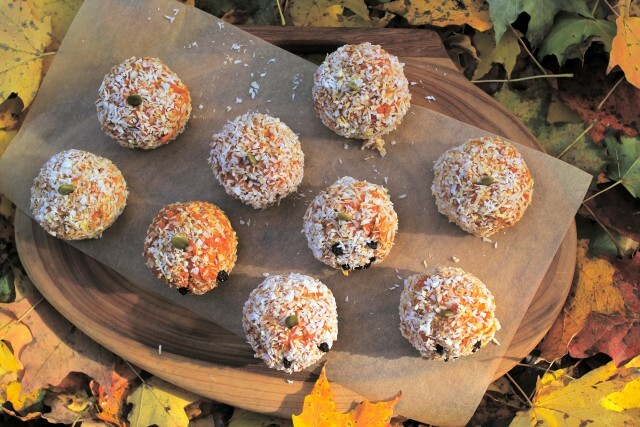 My Halwa-ween Coconut Carrot Truffles are a variation on Chef De Home’s recipe, cutting back on sugar (and using honey instead) and offering less dairy so the carrots shine. The organic condensed milk is the sneaky secret, but honestly, it’s still Halloween and treats must be tasty even if they’re vegetable based! You can find the shredded coconut, pumpkin seeds and black currants on Nuts.com, and I promise you’ll be tickled by the quality of their products and amazing customer service. My mamma first discovered this company when she was on a granola-making kick, and still orders all of her snacks, nuts, sweeteners, dried fruit and more directly online. They are a family-owned company with a cute, catchy and genuine persona that is rare in the digital world! 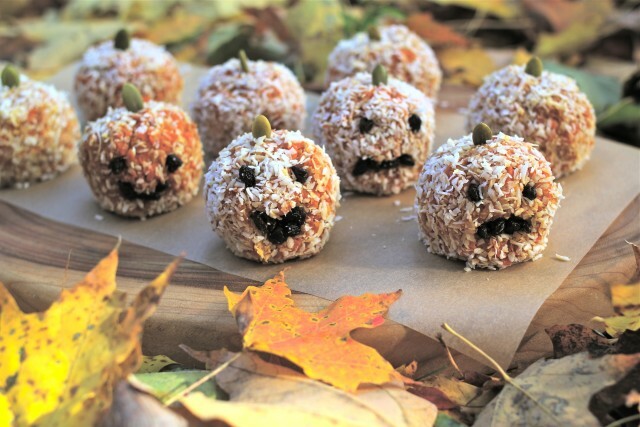 Back to the truffles … it’s fun to have the kiddos roll these into pumpkins and help you make black currant eyes and spooky smiles. Happy Halloween! If you are using organic carrots, don't worry about peeling them. Carrot skins have all sorts of good nutrients from being in contact with the soil. If you're squeamish about dirt, give them a good scrub. When buying condensed milk, look for an organic version. Likewise, if you're substituting coconut milk, make sure that coconut milk is the only ingredient in the can! Melt the butter in your largest saucepan. Add the pumpkin spice and stir for about 30 seconds until the kitchen smells astoundingly good. Add the carrots and sauté for about 5 minutes, until they are slightly softer and some water has been released. Add the honey and milk, and cook for about 15 minutes over medium-high heat, or until the carrots have absorbed all of the liquid. Stir in the condensed milk and 1 cup of shredded coconut. Continue to cook for about 5-10 minutes, until the liquid is fully absorbed again. Remove the pan from the heat and allow the Gajar Halwa to cool. Line a baking sheet with parchment or wax paper and add the remaining shredded coconut to a small bowl. Once the halwa has cooled, roll about 1/4 cup at a time into balls, and then roll in the shredded coconut to coat. Place on the lined baking sheet. Refrigerate for one hour or overnight. Place a pumpkin seed in the top of each truffle, like a pumpkin stem. 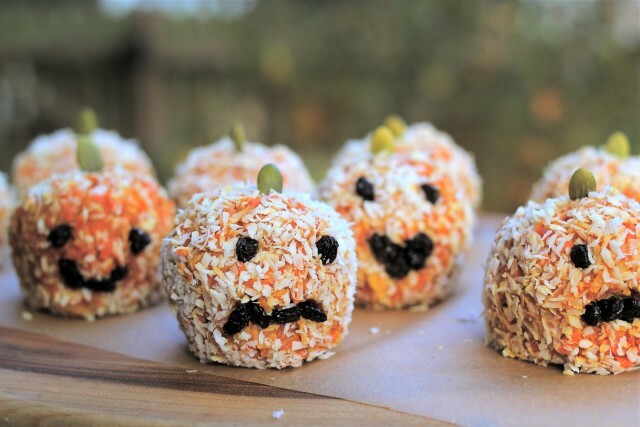 Using a chopstick or toothpick, make holes for eyes and a mouth, and fill the holes with dried black currants. If you are using raisins, you may want to cut them into smaller pieces. Is the condensed milk sweetened condensed milk or evaporated milk? Great question – it’s sweetened condensed milk!